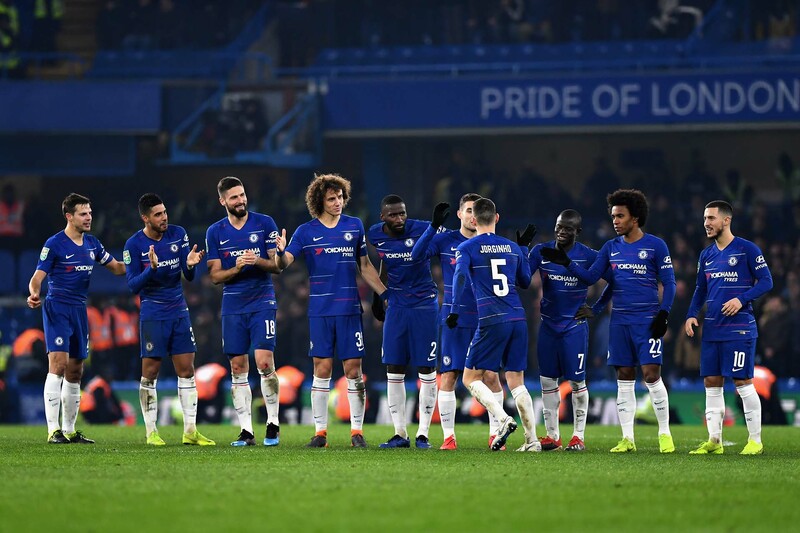 Jorginho celebrates after scoring his penalty in the shootout during the Carabao Cup Semi-Final Second Leg match between Chelsea and Tottenham Hotspur at Stamford Bridge on January 24, 2019 in London. Glen Johnson has called time on his career. After picking up a league title with us Glen won the league cup with Liverpool and the FA Cup at Portsmouth. Glenn was the first signing of Abramovich’s reign and clocked up 72 appearances and four goals in an on and off time at the club. The fallout from the weekend goes on as Sarri takes flack for calling out his players after the match. Rarely do managers at Stamford Bridge last long after publicly criticising their team. Meanwhile, Gonzalo Higuaín remains in Italy waiting for a loan that seems very slow to materialise. Ashley Cole has popped back out of the US woodwork to join Derby County. The left-back who spent eight-years with us – he won the European Cup, don’t you know – signed up with Frank until the end of the season. Sadly, Ronaldo will not rot in jail for not paying his tax in Spain after he was fined about eighteen quid and given a suspended sentence. It does mean that we can call him a cheat and liar without any threat of legal action. The search for the missing plane carrying Cardiff City striker Emiliano Sala has been called off again as stormy seas make it dangerous. Sala signed from Nantes on Saturday and was due back in Cardiff to start work yesterday. He apparently sent a voice message to say the plane he was flying in was falling apart and he was scared. The pilot is also missing. 31-year-old Argentinian striker Gonzalo Higuaín signed on loan until the end of the season from Juventus. We have an option to extend the loan at the end of the season or buy him outright for about £30m. His signature came too late for him to play tomorrow night. A better performance from front to back saw us storm into a two-goal lead with strikes from N’Golo Kanté and Eden Hazard only to concede an aggregate leveller early on the second period that came completely against the run of play. We had chances against a weakened Spurs side to win it outright but penalties were an entertaining way to watch Spurs suffer before waving them off back up the Tottenham High Road. Spurs missed one and Arrizabalaga saved on ensuring that when David Luiz stepped up, he was smashing the winner. The final, against a City side that put ten past Burton Albion over two legs, is in a month’s time. Hugh McIlvanney has passed at the age of 84. For everyone who seeks to add their voice to the public spectacle of sports, Hugh was the best. A very funny and warm man and one who expressed who he was through his writing. McIlvanney wrote for the Observer for most of his professional life covering football, boxing and the horses. He was inducted into the boxing hall of fame for his work on Ali and Sugar Ray Leonard. If you want to know him to go back to his Arena TV series The Football Men about Bill Shankly, Jock Stein and Matt Busby and their Lanarkshire background. This was a man who knew and understood that football has a human depth below the show on the pitch. We often say that public figures who die will be missed but Hugh McIlvanney left such an impression on the game that it will continue to be felt long after his departure. Born in Kilmarnock McIlvanney would have been proud of the work Steve Clarke is doing there. Killie beat Rangers at Rugby Park on Wednesday to send Clarke’s side into second place, a point behind Celtic. If we ever need a new manager, we could do worse. Victor Moses has joined Fenerbahce on an extended loan until the end of the 2019/20 season. Victor has been on loan for most of his Chelsea career but he at least had his moment in the sun as Antonio Conte switched to 3-4-3 with Moses as a wing-back. Matt Miazga’s move back from Nantes and on to Reading is slightly less glamorous. We signed the 23-year-old, USA international in 2016 but haven’t really used him for anything. Matt did have a good season with Vitesse but has struggled this season. News leaks out that Callum Hudson-Odoi has put in a transfer request. No confirmation has come from the club. Meanwhile, Alvaro Morata is in Madrid having a medical ahead of his loan move to Atletico. It seems ages since we had a rivalry with Wednesday, they have been away so long that younger fans might not remember us being in the same league, but they showed up tonight with iodine on their studs and sought to kick, scrape, gouge and stamp their way into the next round. That they didn’t was due to our determination and class and nothing to do with the referee who failed to book any of the four clear contacts between Yorkshire studs and King’s Road ankles. Willian stepped up to jink in the penalty, awarded for the first of the stamping incidents. 30-seconds earlier the visitors had a shout overturned as Ethan Ampadu’s orange boot made clear contact with ball not man. But it took VAR to tell the ref what everyone in the crowd could clearly see. Wednesday rarely threatened and we added to our lead when the busy, wantaway, Callum Hudson-Odoi cut inside and blasted the ball in at the near post and Willian curled in the third. The real interest was in watching new signing Higuaín going through his paces. He looks like he wants to spin in behind defences as we almost set him up a couple of times with through balls or chips. For all the hard work in beating Arsenal we looked a little complacent at the back against an honest but not remarkable Birmingham side. Erin Cuthbert headed us ahead and then scored from a free-kick to draw us level but as we pressed for the winner we slipped up at the back.